‘Campaign for Jazz’ would reach such heights. So much so that I’m concerned that the workload involved in keeping up with this increased online activity and the financial implications might result in the need to curtail aspects of my campaign. One solution is to revert to my initial aim for Jazz&Jazz – to boost jazz by selectively featuring aspects which rivet attention – whether involving bands, musicians, clubs or festivals. But I fear that with the increased popularity of the site, “Topsy” took over. I began to receive spontaneous requests to feature bands, musicians, their music, clubs, events and festivals – with only the occasional offer to cover costs let alone sufficient contributions to help further my ‘Campaign for Jazz’. But the increasing workload did get my ‘Campaign for Jazz’ rolling like the proverbial river. Spend a little time exploring Jazz&Jazz and you will be surprised to discover the volume of content that has built up over the past ten years. Note: Comments can be made below each Jazz&Jazz feature where they are far more relevant and pertinent and frequently lead to exchanges of views (far preferable here than comments made on Facebook). So please, explore that facility. Administered as a service to the club. 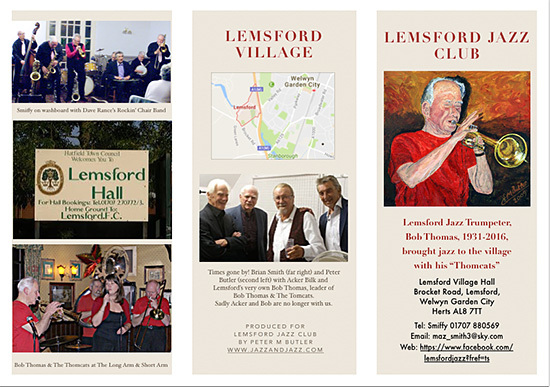 I lived in Lemsford village for 19 years. Brian Smith (aka “Smiffy”) is a close friend. I publish links to all my Jazz&Jazz articles and posts on Linkedin for further outreach. Such are the pressures and increasing financial implications resulting from the excessive amount of time spent on my online presentations that I will have to bite the bullet and introduce limitations to such activities. Donate Button in the column to the right. TO HELP KEEP JAZZ LIVE AND ALIVE! Flashback to the wonderful times! L/R: Bob Thomas of Bob Thomas and The Thomcats, myself, Acker Bilk, Brian Smith of Lemsford Jazz Club. Rider: Rather than limit your comments to online social media sites please use “Speak Your Mind” below each Jazz&Jazz feature, where comments and exchanges of views will be targeted and specific. You can begin now by commenting on this post. Far better than posting comments on Facebook which are soon swallowed up in the morass!